Congratulations! Let’s make your life smoother now! You made it through the home buying process and found your dream home. Now for the next step: moving! Before you start stressing out and tossing everything into garbage bags the morning the movers arrive, here are some tips that will help save you time and make your next move easier. it’s easy to spend a mini fortune on moving boxes. Save your cash and try finding free boxes. You can try Craigslist ‘Free’ section, grocery and clothing stores or warehouse stores. Packing and organizing for a move can be overwhelming but planning and slowly packing your home can help lessen the stress. 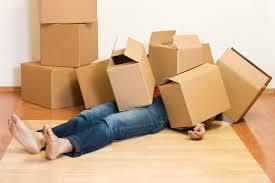 Start by packing non essentials and slowly make your through your belongings as you get closer to your move date. Before you disconnect your television, snap a quick picture of the cords on the back for your TV or other electronic device so you can remember where they go when you unpack in the new house. Use color stickers, labels or duct tape to assign each room in your house a color and mark corresponding boxes in the specified color. When you get to the new home, place the colored sticker on the door of each room to help direct movers on where to place each box. Not everyone is completely moved in at the end of moving day so avoid running around trying to locate your pajamas or coffee maker, pack a box with some things you’ll need for that first evening and morning in your new home so it’s easy to find. If your children are too young to help pack, you may want to consider hiring a sitter or arranging for a friend/family member to watch the kiddos (or pets!) so you can focus on packing and moving. Instead of unpacking your dresser or closet, try these hacks: wrap your dresser in plastic wrap to keep the drawers from opening (remember it will be heavier to move!). This trick works for any box-like container (like toy chests, drawer organizers, the list goes on!) For your closet, slide garbage bags directly over your hanging clothes. Also use suitcases to make moving heavy items like books easier. item they came from so you don’t have to locate them later. Designing a floor plan for your new home before you move is an often overlooked but can save you time and money on moving day. Instead of using precious hours having the movers rearranging furniture, you’ll be able to place those larger pieces and move on to the next task.